MISS NATASHA ENQUIST: ELECTRO-ACCORDION CHANTEUSE: Cute Attack! Rehearsals have been underway since early last week. It's always an intense rush to get everything figured out, dance numbers memorized, who is going to say what etc. 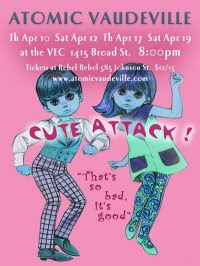 Atomic Vaudeville presents CUTE ATTACK "It's so bad, it's good"
4 nights of cute overload with a dizzying number of cast members, a keytar and plush toys. at the VEC 1415 Broad St.
at Rebel Rebel 585 Johnson St.